A Happy Healthy Mummy: Does winter make you SAD? I have to admit I've really struggled with the short days and dark mornings this winter. I juggle herding the kids to and from school, taking two dog walks, a trip to the gym and working (please note my priorities there!) in what has seemed like ever-decreasing daylight! And when the alarm goes off at 7am, I'd really like to hit snooze; for about two hours! And yet, do you see me heading to bed at 10pm, ummm no. Of course, I'm not alone in hating getting up when the sun has yet to rise! As many as a quarter of us experience the winter blues and seven per cent within that group suffer from Seasonal Affective Disorder (SAD). It's thought that the dawn light level in winter is too weak to signal the pineal gland to stop producing the sleep hormone melatonin; which leads to over-sleeping and grogginess in the mornings. And the modern trend of spending most of our day indoors means we also have insufficient light exposure, which can make us feel tired and down. But hibernating isn't an option - and in most cases - neither is just taking these few months easy. So what can you do to improve your mood and energy levels? Cambridge-based Lumie specialises in light therapy, which has been shown to be effective in beating the winter blues and mitigating SAD symptoms. It manufactures a range of Bodyclock lights that simulate a gentle sunrise during the last period of sleep. The light stimulates production of the hormones that help us get up and go, like cortisol, while suppressing those that bring on sleep. It also produces bright light boxes that emit a much higher light intensity or lux (the amount of visible light a person receives at a given point) than standard lighting. This exposure to light stimulates the brain to produce more serotonin, a hormone that positively affects your mood, and less melatonin, which makes you feel sleepy. Even if you’re not affected by the winter, sitting with a bright light will make you feel more alert and energetic at any time of day. Typically, 30 to 60 minutes is enough to feel the benefits and the therapy is cumulative so it doesn’t have to be taken all at once. Leeds University even has a special light café for its students this month. Now in its third year, the café provides an alternate revision space that is designed to improve students’ health and wellbeing (typically at a low point at this time of year). The lights will also be used in meditation and yoga workshops. I suddenly wish I was back at uni! 1. Don’t snooze – your body-clock likes a regular routine so keep to the same wake-up time even at weekends. 2. 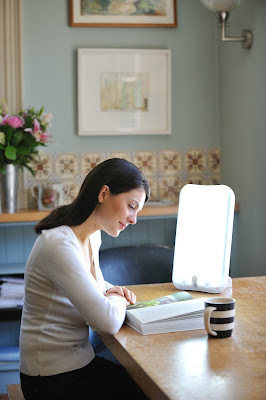 Ditch a shrill phone alarm for a natural sunrise (Lumie Bodyclocks offer this!). 3. Get some light exposure first thing – if you can’t get outside then use a light box over breakfast. 4. Try to get outside for 30 minutes at lunchtime. 5. Use a light box early afternoon to beat the dreaded post-lunch slump. 6. Avoid tech gadgets at least an hour before bedtime and use a low-blue light feature. 7. Use Lumie Bodyclock’s gentle sunset feature to help you drift off to a good night’s sleep. So now you have no excuse not to rise AND shine! Interesting idea, never heard of it before. I would really like to find more information like this, sometimes I am just hungry for something brand new to try or to learn. Thanks for posting. Walk a mile in someone else's shoes.. Healthy homes are heated homes!